SCSC is a concerned party and acts in a responsible manner when it comes to addressing the environmental impact the terminal is having on surrounding areas. As a consequence SCSC has equipped its facilities and is implemented management systems that both help support a good working environment and keeps the terminal on good footing with its surroundings. 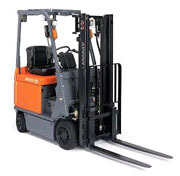 The warehouse is equipped with electric forklifts that generate no CO2 emission at all and helps reduce noise. Electric forklifts are powered by battery so that the sound generated is far less than would be if conventional forklifts where in use. Sky light in the warehouse roof area, covering 15 % of the surface, helps reduce power consumption. Propeller type ceiling fans are in operation to circulate the air in the warehouse. Ceiling exhaust fans fitted in the roof deliver an air exchange rate. SCSC cargo terminal is using handheld devices and apply Hermes management systems, which means the warehouse no longer requires paper records when registering and storing data.